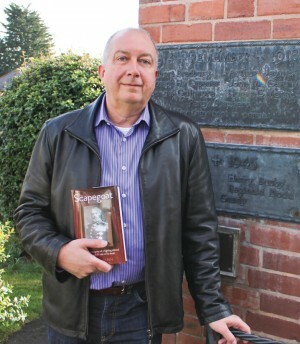 Almost 100 years since the start of the First World War, a Barnt Green author is hoping to restore the reputation of one of the conflict’s most maligned figures. Steve Dunn, of Fiery Hill Drive, has spent 20 years researching the life and career of Rear Admiral Sir Christopher (Kit) Cradock, who was held responsible for the worst naval disaster in a century – the Battle of Coronel, where he and 1,660 men died on November 1, 1914. 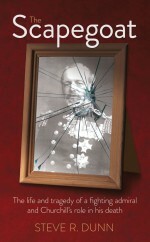 Steve’s debut book, The Scapegoat, challenges the official version of events as presented by Winston Churchill – then First Lord of the Admiralty – who seemingly destroyed Cradock’s reputation to save his own. The author’s in-depth research, born from a longstanding interest in British naval history, included talking to Kit’s only living relative and having access to many previously unseen papers. “I want people to know my intention is to honour Cradock rather than condemn Churchill, who did become one of our greatest war leaders,” says Steve. Steve maintains that Cradock was badly advised and equipped and that his orders left him in no doubt that he was expected to engage with the enemy, even though he’d outlined his concerns. “He faced up to an impossible task with courage, which I think makes him a hero. Steve’s second book, which he describes as a companion piece to The Scapegoat, is due out this October. The Coward? The Rise and Fall of the Silver King is a biography of Admiral Ernest Troubridge, whose decision not to engage with superior forces saw him court-martialled – a fate which Cradock was determined not to share. The Scapegoat is published by Book Guild Ltd. Available from Amazon (hardback and e-book) and all good booksellers. Anyone with an interest in history and justice will enjoy this well-written tale about one of the Great War’s lesser-known characters and how his death and vilification exemplify the madness of that conflict. Outdated equipment, ambiguous orders and the Churchillian stitch-up aside, the author recognises that Cradock was also a victim of his own sense of duty. Dunn describes Cradock as a “prisoner of the zeitgeist”, who adhered absolutely to the era’s beliefs in honour, loyalty and, above all, following a superior’s orders without question – something Kit was particularly used to, having begun his naval career at just twelve years old. A patriot to the core, it’s easy to see that instead of becoming disillusioned by a recent series of naval failures, Cradock would have been desperate to uphold the reputation of the Navy, and indeed the country – even at the expense of his life. It’s almost impossible to imagine such motivations now, but the author, perhaps recognising that modern readers might find it difficult to identify with the “know-your-place” status quo of a vanished age, puts Kit’s ideals in context by offering not only a detailed biography of his life and career but also a wider exploration of “Vicwardian” attitudes and mores. Dunn’s extensive research has turned up plenty of material that reveals the character of his hero and how he was viewed by his contemporaries – and for aspects of Kit’s life where information is sketchy, the author has allowed himself a certain amount of speculation (for instance, that the lifelong bachelor had a mistress and may even have fathered her child). More factually, records of communications between Cradock and the Admiralty show how he was sent into battle on the grounds of dodgy intelligence (some things haven’t changed, then) and promised re-inforcements that never arrived.